This morning I took a break from mountain climbing to visit Suizenji Jojuen, a 17th century garden established by the Hosokawa samurai clan, who ruled Kumamoto at that time. “Bait for dove.” Works pretty well, I’d say. At the entrance to the garden, a gentleman sells food for the koi and birds that inhabit the park — the English translation of his sign reads “Bait for Dove,” which sealed the deal for me. 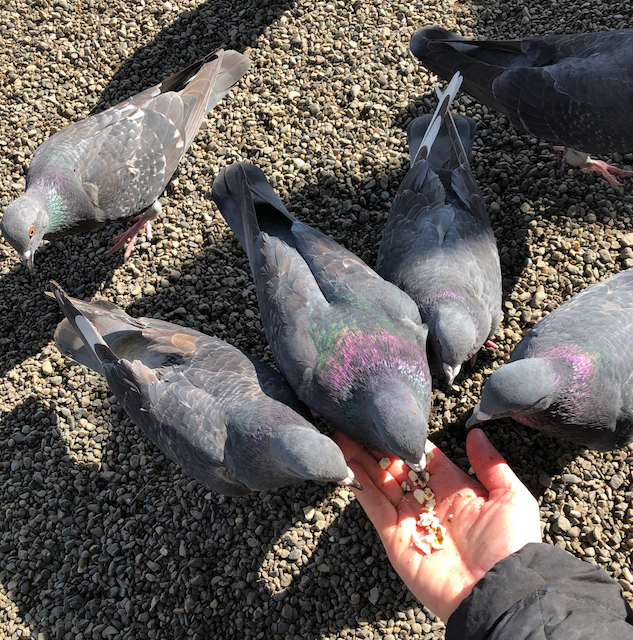 I love birds (including the ones called “doves” in Japan but known as pigeons in the USA) and jump at the chance to feed them. Popcorn. Fortunately, not also poop-corn. And within moments, a couple flew up to roost on my arm and eat from my hand. To my surprise (and relief) I didn’t get pooped on once. The doves were surprisingly gentle feeders. They never pecked my hands. 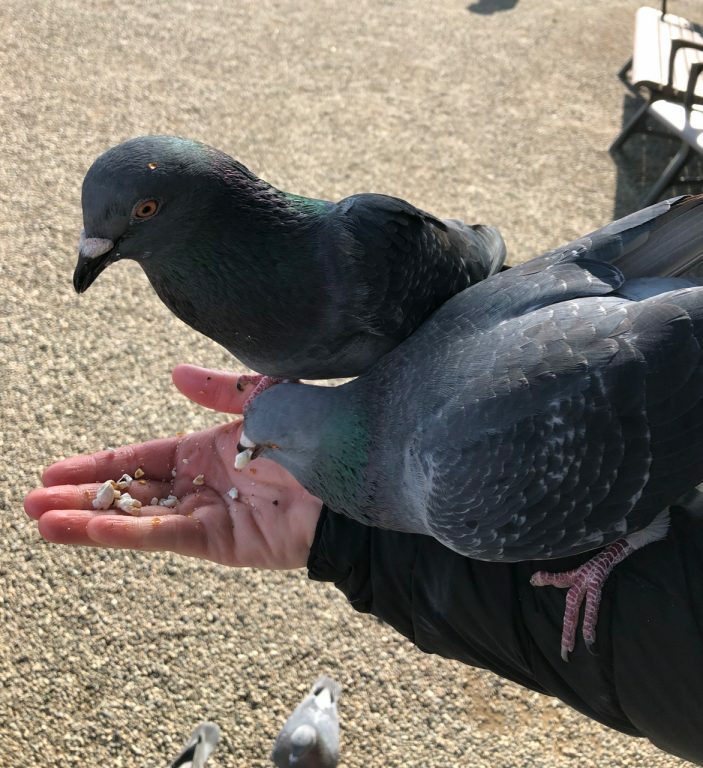 Their feathers felt even softer than I expected, and while they didn’t put up with much touching, they were happy to sit on my arms (and later, knees) and coo at me even when the food was gone. They like the koi food too. 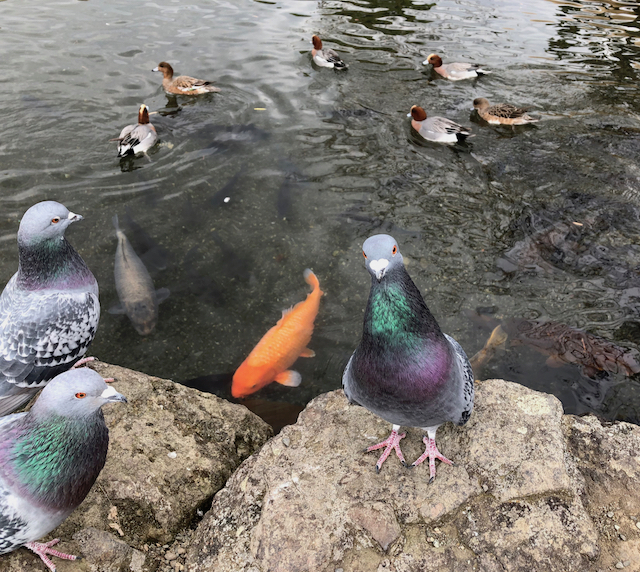 After spending a couple of hours enjoying the garden, I stopped to feed the ducks and koi at the far end of the park–but within moments, the doves figured out what was going on and joined us, hoping for another snack. The park alone would have been enough to make this day a wonderful, restful experience, but getting to interact with wild animals always fills my heart with joy. 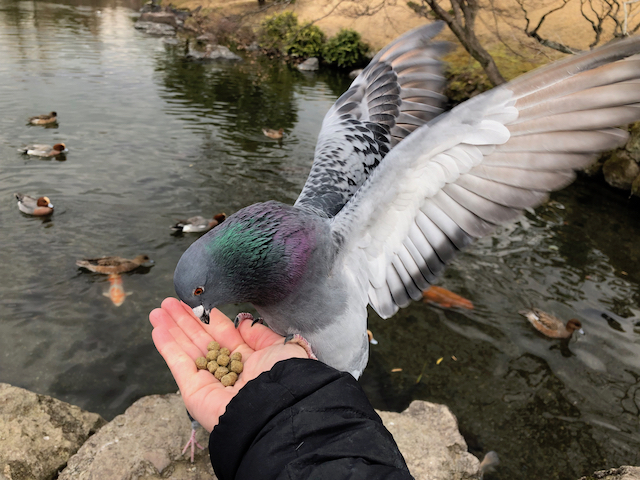 Do you like feeding the animals at parks and other places? Or are animal encounters something you prefer to leave for someone else? I love wildlife encounters – I used to go to zoos and parks where you can feed the animals rather regularly as a child and a bit as a teen. However, most of all my encounters now are self-directed and have a bit of grace in the unexpected. I love having my camera with me – ready to capture a moment in time and have it last longer than the lingering memory of living it – though there are other moments where I do not photograph anything and let my mind and heart just soak in the time I’m spending in nature. The natural world gives us so much to contemplate and to consider… the presence of wild animals never fails to teach me something and it is how intuitively intune they are with us that lingers the longest. They see us in a way we might not always observe them and in those moments there are lessons longer than mere words or emotions can express the gratitude for the encounter. I also loved the ones whose wings and markings were so cleverly captured when resting near your hand to eat the food? How did you take the photos? Was it tricky to balance being in the moment and capturing the moment at the same time? Hello Jorie! It’s great to hear from you. I’ve loved photography since I was very small – my father loved it too. I took the photos using my iPhone camera – and it was a little tricky sometimes, because it’s hard to take good shots one-handed, but I did my best. I take so many photos that it didn’t distract me too much – and the doves stayed around long enough that I had quite a bit of time to enjoy them without worrying about the photos, too.